Volunteering at my children’s school has been one of the best decisions I’ve ever made. Because I work from home, I can fit volunteering into my schedule fairly easily. Working parents have a harder time because their schedule is less flexible. However, I see lots of working parents volunteer for special days at my children’s school. Some can only do an hour of lunch duty once a month or so. Every little bit helps, especially with the current budget cuts in school funding. More than ever, parent volunteers are vital to public and private schools. As parent, I get a lot out of volunteering. I’ve been able to volunteer in several capacities at school during the day plus I’ve come in after school to help with fundraisers and other projects. At first, I was pretty nervous despite working in the fundraising field and working with volunteers. Now I was the volunteer. Thanks to volunteering, I’ve gained more people and team skills, plus met some fabulous moms who are now my friends. 1. Meet your children’s teachers more informally and in different settings. Working along side a teacher on a group recycling project or coming after school to help set up for an event can show the human side of teachers. Just like the parents, they are invested in the school and want to see the students succeed. Getting to know another side of your child’s teacher gives you the opportunity to talk about other subjects, even if it’s just how the weather is going to affect the event. There’s a lot of relationship-building value in small talk. Don’t forget, teachers can be just as uncomfortable talking to parents as parents are to teachers. One of my children’s teachers is a bit shy with the parents. Having the opportunity to be her homeroom mom helped me build a more open relationship with her, and hopefully, we’ll both be more comfortable with dealing with issues when my last 2 children are in her classroom. 2. Get to know the students in your children’s class(es). Last year I didn’t have the opportunity to volunteer for lunch duty when my 2nd grader was in the cafeteria. Because of the closing of a number of Catholic schools in our area, my son had about 8 new students from another school in his class. I did my best to get to know them, and yet, I still struggled with their names because I hadn’t invested the same amount of time with them as I had with the other students. For me, my son will be spending 10 years with his class. Knowing the students and their parents is an investment in his future success with his peers. 3. Get to know the school administrative staff. Teachers and administrative staff are the backbone of a school. It’s important to have a working relationship with both. When I worked in fundraising, I spent just as much time getting to know the mail guy as I did the library director’s secretary. Both were vital to our fundraising team when we needed to host events for our donors in the library or do a mass mailing to our members. They would do their job, of course, and they were willing to go the extra mile when needed because they felt valued by myself and our office. As a new parent, one of the best choices I made was getting to know the school secretary. Yes, the principal is extremely important. However, on a daily basis, when I was a new homeroom mom, it was the school secretary I turned to first when I wasn’t sure how to do something. Besides doing a gift for the secretary at Christmas time and the end of the year, I also made sure to recognize her in little ways during the year. I did the same for the music teacher, computer teacher, and gym teacher who I felt often went unrecognized by parents for their hardwork with the students. If you’re an introvert like me, sometimes it’s easier to meet people if you can work alongside of them. Because my children are still pretty young, even though I tried chatting with other parents during pickup, I often found myself stopping a conversation to take care of a child or two. If I encountered a quieter parent during pickup and later saw them during lunch duty, I would use that time to draw them out a little and get to know them. 5. Show your children how much you value their education. We know our children watch what we do, just as much if not more than they listen to what we say. When they see us reading a book for us, or reading a book to them, they learn that books are important. If we take the time to volunteer at their school, even if it’s Guest Reader for the day once or twice during the year, our children know we value their education and their school. They know what we value by how we spend our time. 6. We can help keep a school’s overhead lower. Schools, all kinds of schools, are facing budget cuts. Teachers do what they can with what they have, and often, teachers will use some of their own money to make a difference where they can. 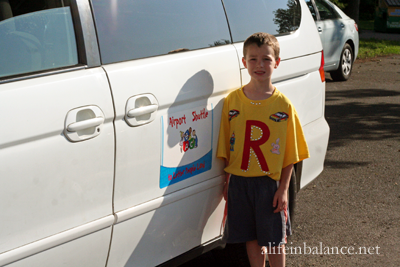 Parents can do the same by volunteering and helping with fundraising initiatives for their school. At my children’s school, the lunchroom is volunteer-driven. We have no paid aides. 4 to 5 moms come in every day for an hour to supervise the children while the teachers lunch. The preschool and Kindergarten programs have their own lunch mom volunteers. That’s 7 moms coming in daily to help with 300 students. That’s an amazing commitment! 7. Networking and resume-building if you need to go back into the work force. Having volunteer leadership positions or team volunteering positions on your resume can show potential employers your ability to work with a wide range of people under budget or time-constrained situations. Taking the lead on a fundraising project is another good resume builder. When you volunteer, you show that you’re willing to give back to your community and you’re invested in your community. 8. You have the opportunity to stretch yourself in new skill areas. Maybe you’re an introvert like me, and the thought of public speaking is a bit stressful. Yet, I sat down in front of a group of 20 students with their teacher several times and read them books. I’ve also had to take a group of 28 students out of the classrom to outdoor recess, no mean feat when one is dealing with preschoolers. Or, how about figuring out how to deal with an overbearing parent when you can’t walk away because your child will be in the same class as theirs for the next 10 years. Last fall, I volunteered to help with a Ladies Night Out at my children’s school. My job was to help with soliciting prizes for the raffle. Even though I had worked in fundraising, I had never been the person asking the donor for money. Doing Ladies Night Out taught me how to approach local businesses and to be a good representative of my school. It also taught me to have a thick skin when businesses gave really small donations or didn’t return my phone calls. There are many opportunities for volunteering that fit your schedule. 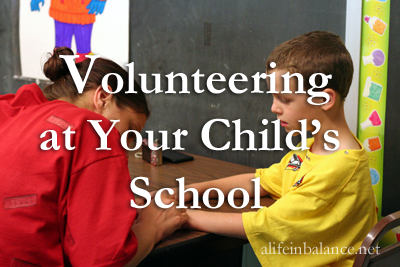 Do you volunteer at your children’s school? My daughter just started Kindergarten and I just received the volunteer schedule. I can’t wait to go into her class! This post just reminded me of why I am so excited for it! I love volunteering at our school. It’s been a great way to get to know the teachers and other parents. I love this! As parents we need to be as involved as possible in our children’s lives. This article reminds us why it is so beneficial for everyone involved!! These are great benefits of volunteering at your child’s school. I think the biggest and most important benefit of all is that your child will know that you care. Too funny. I Just signed up this morning to volunteer during back to school week. I don’t do a ton at my kids’ school, but I always enjoy it when I do, and I know they like seeing me there. Jo-Lynne Shane recently posted..Greetings from the Chic Hotel Monaco in Downtown Baltimore! LOL I bet that’s a fun week to volunteer! This post is great! I love volunteering at my kid’s school and I find I like it for a lot of the reasons above. It is very fulfilling and I love if i actually get to see my kids while volunteering. That is probably why every year I sign up as homeroom mom. LOL Another one just like me – the crazy ones who sign up to be homeroom mom. I love volunteering in my kids classrooms, I think it’s so important for parents to come in if they can! Yes, I agree. And, there are so many ways to volunteer. All a parent has to do is ask how they can help. I love volunteering at school. Hoping to find more opportunities this year but it might be harder since I will be working part time outside of the home. My favorite way is lunch duty. It’s only an hour at a set time, and I get to see all my kids. I am a big believer in giving back to the community through volunteering and doing this at your children’s school is so rewarding. My son is only two and not yet attending school however when my step daughter was living with me, I volunteered at the school library, school discos, athletics events and movie nights. I agree with you that volunteering is a great way to get to know the school community and I also know my step daughter also appreciated me being there. I currently volunteer at my local toy library – something my son enjoys very much! Stopping by from Turn it Up Tuesday.